Multi Language! - Fast Free Shipping! produto chegou perfeito, faltou penas a Nota Fiscal. Vou entrar em contato. Excellent. Item is brand new and came on time. It was essentially because of this camera that I switched from Canon to Nikon. I've shot on a 5D Mark II for years and upgraded to the 5D Mark III. Then came the Nikon D750. For quite a bit less money than the Mark III, you get more features and better performance. Aside from the fact that you get 2 more megapixels with the D750, the sensor all around is far beyond the Mark III. The dynamic range of the D750 kills the Mark III. The information it keeps in the shadows is pretty awesome. Not to mention the high ISO performance is better than the Mark III. The auto focusing system is as good if not better than the Mark III. It has a built in intervalometer, which is something Canon has yet to do. Video capabilities are excellent and once again are on par with the Mark III if not better. You also get 60fps and 24fps at 1080p which is very nice to have. It is also the first full frame DSLR to have a tilt-screen (which comes in handy for video work or high and low shots for photography). Overall, this camera is an amazing value for the money. I just don't see how the Canon 6D and the Mark III can compete with the D750. Get this camera, it won't disappoint. The Nikon D750 feels just right, not flimsy like my Nikon D5100. The main selling point for me is the 50% wider angle that all FX camera captures. I love my 35mm f1.8 and the only thing I wish could be better is that the picture gets wider. And I hardly uses my 50mm f1.8 at all because it's just too narrow for me. Now on the D750, I absolutely love the pictures coming from my 35mm and I am pulling out my 50mm as well now that its images is 50% wider. I am able to get a more shallow depth of field on FX so my portrait is much more eye catching with more interesting background blur than before. And for landscape, the much wider angle that I am able to capture is worth the upgrade alone. Another part I like about the camera is its superior low light performance. With my 50mm and 35mm f1.8, there are few situations where I need the flash. I also low the wide dynamic range of this camera. In all my photographs now, the picture looks right and one look at the histogram confirms it. And I am really thankful that Nikon makes DX lens compatible with FX camera. I do very little wildlife photography so I am fine using my 18-200mm DX lens on this body. It does not bother me that I have to set the camera to DX mode and let it crop. I always crop my wildlife photograph anyway. Having upgraded from a D3200, the difference in quality (both of the camera and the image quality) is evident. The thing I like best so far is how much bigger and brighter the viewfinder is. Of course, the image quality is also great (more dynamic range, and way less noise with higher ISO). I still need to figure out how to properly use the auto focusing system since it has many more features than my old camera. Anyone upgrading from lower end models will definitely want to take time to learn all the features of this camera. My only complaint so far is that the rubber eye cup can easily fall off (especially if you use a hand grip like I do and rub the camera against your leg while walking). Also, the shutter button is more "touchy" than my previous camera so while trying to engage the auto-focus by half-pressing the shutter button I've taken several shots by accident. I'll probably look into using back-button focus instead. Overall, awesome camera though. This is a long overdue upgrade for me from DX sensor to FX. It’s so nice to use my old but solid Nikkor lenses from my 35mm film cameras at their proper focal lengths! The camera has superb features, including video. I love the built-in WiFi connectivity, making it easy to get photos into my phone for quick sharing on social media apps. Dual SD card slots are another welcome feature. I have been a Nikon user for three decades and glad I stuck with the product line all this time. 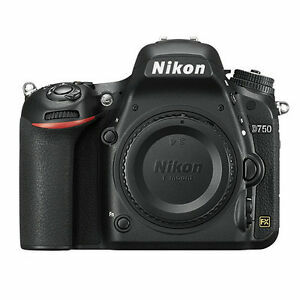 I have been a long time Nikon user having had a D300 since 2008! I had a D80 and D90 as my second bodies and finally got the D750 to be my main body replacing the D300. The D750 body is actually smaller than the D300 mostly in thickness. Yet, the grip is better because the right hand grip is deeper. The shutter is fairly quiet. I have used the extendable rear LCD to take some very high up and very low angle photos using it and Live View. The high ISO image quality is very good. The D750 still has a pop-up flash built in which is helpful when in a pinch and just want to get a clear snapshot of something. Overall the D750 is an excellent way to enter the world of Nikon full frame bodies providing great value and features.